A photographer friend of mine once shot a series she called "The Secret Life of Concrete," revealing loneliness and lust among the deserted buildings of Toronto's lakeside Cherry Street. Sometimes, on the city's really gray days, I think about the mystery and vitality of those pictures. Stockholm octet the Concretes do pictures well, too. The cover alone of their current self-titled sophomore release will grab you, with its stark sketch of a shockingly red leopard cub, its gaze both playful and menacing. On the first page of the booklet, a suspicious and baggy-eyed woman purses crimson lips as the smoke from her cigarette takes the shape of a foreboding city block, while the words "And to think of all the things I had in mind for you and me" hover next to her. 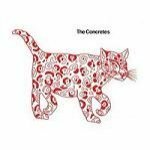 Definitely mysterious, but the songs on this record are obvious when it comes to the Concretes' influences, starting with titles like You Can't Hurry Love (not a cover) and Diana Ross. The band does Motown justice on the first track, Say Something New, whose opening organ borrows excitement quite successfully from the Vandellas' Dancing in the Street's introductory horns, followed by just-as-if-not-more infectious tambourines. Also good are Seems Fine, with its ska-meets-britpop blend of trumpets and synthesizer, and Warm Night, a waltzy number whose mandolin, violins, and choir of voices soften the blow of grown-up love, "Although I'll make sure we fall on safe ground I wouldn't lay your faith in my hands." The band's hat-tipping doesn't work as well in other places. New Friend sounds like a Mazzy Star-Velvet Underground hybrid, which, though brave, may not have been wise. Vocalist/lyricist Victoria Bergsman has a gift for cool and sweet singing, but if she is invoking Sandoval's signature note-warping, her attempt is more like a reminder that no one else should really try to do that. And the innocent, sing-songy background vocals "If you need a friend" had me digging out Stephanie Said. Both Bergsman's and the background vocalists' audible straining to reach and then hold some of the higher notes in down-tempo and sparser songs like Chico and Lovin Kind are a little bit wincing. This is too bad, because each song has unique loveliness; Chico includes the album's first appearance of a harp, but its key ingredient is a demure chiming of bells that both starts and holds the song together. The lyrics of Lovin Kind rival the intrigue of the CD's pictures, "She needed loving in the morning, he kept asking her why," and its instrumental parts are beautiful, offering a perfect dance between guitar and piano, an aching trumpet solo. The band's best moment comes near the end, in Lonely As Can Be, whose urgent 16th beated start gives way to a regal, trumpet-led entrance. Bergsman is highly believable in this song, and her lament "Well, there he goes again" seems to clear the way at last for a bit of danger, quickly offered by what may be the Concretes' best asset, the trumpets, at their messiest here. But the crowning threat is a scrappy guitar solo, buried early on, and then proudly paraded alongside the horns. As the Concretes clamour to end the song the way they started it, they finally have said something new.